This month saw all key stage one children in English schools given the chance to eat a hot meal at school for free every day. The scheme is expected to save parents like myself £400 a year per child. Now in theory this sounds great but I'm not convinced. Here are just three reasons that have me questioning the scheme and its intentions. Well we are told it is free but lets be honest, nothing where the government is concerned is really free. I mean we'll be paying for this through our taxes. And in that case I'd like to know why school meals can't be free across the board. At the moment I have three children at school, one in reception, one in year 2 and one in year 4. Meaning that two of my children get free meals whilst the other I'd have to pay for. This something I can't afford, now for some it might not seem a lot of money to pay out but to me it is, I just can't budget in another bill. This means that my eldest has to have a packed lunch, luckily she is an easy going child and doesn't mind. However I'm sure there are children out there who wouldn't be so happy if put in the same situation. It was general secretary Christine Bower that said, "children do not stop being hungry at seven years of age". I have always bought my children up to be independent and I think it is great that they have a bit of choice when it comes to the dinner menu but I worry that they either won't eat enough, will eat too much or just pick the wrong thing entirely. Take for instance my 6 year old. On the dinner menu the other day was sausage roll. So what did she have with her sausage roll? Potatoes, beans, cucumber and pasta. Pasta?? Pasta wasn't even on the menu that day so I don't know where she found it. But my point, where was someone monitoring what the kids were picking making sure they have a good balance of things on their plate? Schools are legally required to provide meals that comply with the government's 'School Food Standards'. These are apparently put in place to ensure each child gets the nutrition that their body needs throughout the school day. I have to chuckle at this. We as parents get moaned at for what we put in our child's pack lunch. Heaven forbid we provide them with a packet of crisps or a chocolate bar. Yet if you have school dinners you get the choice of things like pizza, burger, chips as well as having the option of eating a pudding every day. Since when is dessert nutritionally balanced?? My children certainly don't get pudding every day of the week, I see it as a treat. Like I said at the beginning of my rant, in theory the concept sounds good but like many things in life, it has its flaws. I'm keeping my fingers crossed that over the coming months as the programme comes into full swing that measures will be taken to improve the scheme and make it truly beneficial for everyone. I think it very much depends on the school. 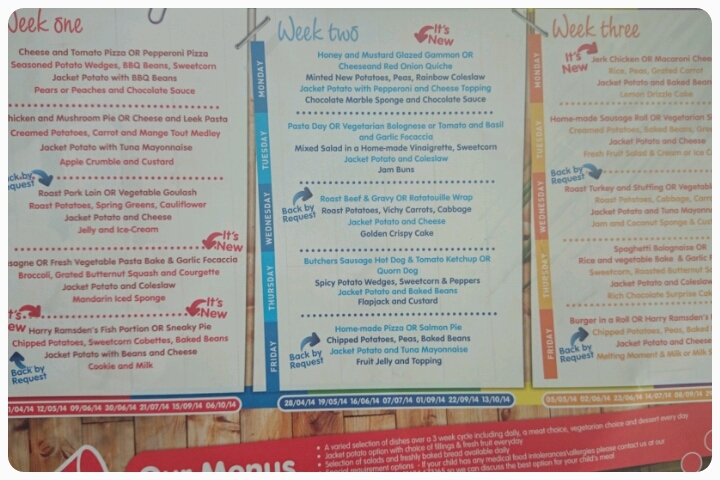 My boys school has meals cooked on site, and whilst they definitely aren't perfect (and yes, pasta seems to be available with every meal - I am guessing to quieten the 'but my child only eats pasta' brigade'), they have to choose 1 of the vegetables (but can have more) and they always have fresh fruit/yogurt option for pudding. Though they also get more typical school puddings too - ie, jammy rice krispy cake. My only concern is the portion size. At our school not so much of an issue as it's a small school and the dinner lady knows all the children and serves accordingly, but in a big school, I suspect there are alot of hungry children after lunch as the portions, to me, seem tiny. Does the cost saving of not making packed lunches for the youngest two not mean you can reallocate that money for the eldest to have dinners some days? the menu itself isn't the worst and the girls enjoy the dinners, I just think it still gravitates back to "classic" dishes rather than healthier options, when this is something the government are continually talking about. I also have children in reception, year 2 and year 4...I pay for my 8 year old to have school dinners as he was really upset at the thought of his brother and sister having them without him. Our school meals are really good though, with three hot choices, three sandwich bag options and lots of veg plus a salad bar and fruit and yoghurt on offer every day. We have to pick the lunch the younger two want each morning and have the menus in advance so do get some control over what they eat. The pudding thing drives me bonkers, mainly because now I feel I cannot have pudding at all at home, otherwise my son will have eaten stodgy chocolate cakey custardy something twice in one day, which I don't get any. Since he has only just decided he likes stodgy cakey custardy something, this is double annoying. Plus! Our school used to have excellent (if pricy) meals bought in from some kind of catering company, but they have taken advantage of the government grants to fix up a kitchen. 1) it's not ready yet and 2) I don't think when it is that such a small school will be able to provide the range and quality of what they had before. And there will *still* be puddings. Gah. To be honest, I;d rather the money were spent on more subsidised class trips, or lessons other than reading/ writing.